Freeing the Health Reform Debate from Politics? I’ve been wondering recently how well the health reform debate can be freed from the bickering of partisan politics. I’m getting more and more cynical about it, and here’s why: The most apolitical objective research one can conduct is certain to become fuel for the political fire for one side or the other. Granted, the researcher can–and should–remain objective in his or her analysis, unless we count the selection of which questions to investigate as inherently biased–which it may well be. The problem is that the results of research do not make decisions. Rather, decision-makers do and these individuals are typically awash in a sea of politics. Consequently, the decision-maker usually has some idea of what they want to do, and they are looking to the research to confirm their inherent wisdom. When it fails to do so, the problem lies with the research, not the decision-maker, and the results are cast aside. I don’t like this, but I can understand why it happens. But what about the public? Why are they so quick to discount evidence in favor of things like feelings? Why do people who loudly proclaim their distrust of government look more to politicians for guidance than they do independent research? Is it merely that they distrust those in the government who espouse a different view from their own, while in all matters blindly trusting those who agree with them on some issue? Why, for instance, do people continue to think that President Obama is not a natural-born citizen even after the White House has made two versions of his birth certificate publicly available? That should serve as ample evidence of the man’s origins regardless of whether or not you agree with his policies. Similarly, how many people do you need to hear say that we already ration health care in this country before you acknowledge that fact? How many well-argued pieces do you need to read to understand that health care doesn’t work like most other goods and services? That health insurance has very real limitations? That the system isn’t fair? Well, according to the results of a recent poll, we might finally be getting somewhere. And yet, there are politicians on both sides of this issue, and the people only seem to be responding to their own economic crises. Perhaps we’re no closer after all, and health reform and politics can never be disentangled. I have my thoughts about the “why” behind all of these differences, and from what I’ve written before, you can probably figure some of them out, but I wanted to leave the analysis of this up to my readers. What do you see? How are the remarks similar? How are they different? What do you think these similarities and differences mean? Think about it and leave a comment. Chances are not everyone will see things the same way. A lot has happened in the past couple of weeks. The proposed regulations for accountable care organizations came out, Rep. Paul Ryan released a GOP budget plan, and just yesterday President Obama laid out his own plan to reduce the deficit. A variety of views on these and other issues are included in the latest Health Wonk Review hosted by David Williams of the Health Business Blog. Check it out here. The hospital isn’t really ever a place you want to be. Granted, that’s changed a lot over the last several decades, back when hospitals were just places people went to die. Now, at least, hospitals are places many people go to get better, but they’re still dangerous. All sorts of bad things, known as “adverse events,” can happen within the walls of the hospital. You can catch a nosocomial (hospital-acquired) infection. You can take the wrong medication or too much or too little of the right medication. You can have the wrong leg amputated in surgery. You can be the wrong patient in surgery to begin with. You can develop pressure sores if you are stuck in bed for too long. You can slip and fall if you get out of bed too soon. The list goes on and on. Identifying these adverse events, so that they may be prevented in the future, is a key aspect of improving health care quality. A recent Health Affairs article by Classen et al. compares several different methods for identifying adverse events. For the layperson, the take home message is: Adverse events are much more common than previously thought. It all depends on how attempts are made to measure them. As it turns out, the Global Trigger Tool developed by the Institute for Healthcare Improvement finds a lot more adverse events than any of the other widely used methods, including one developed by the Agency for Healthcare Research and Quality (AHRQ). What kind of difference are we talking about? Well, in a review of 795 patient records, AHRQ’s method identified 35 adverse events. The Global Trigger Tool identified 354 adverse events. That is what we in the business call “an order of magnitude.” And, compared to local hospital reporting systems that identified only 4 adverse events, we’re talking about two orders of magnitude (i.e., about a 100-fold difference). Just when you thought it was safe to go back in the water…..
Today I want to talk about Paul Ryan’s proposed federal budget and ask some very serious questions of my readers as the clock keeps counting down towards a government shutdown. I was originally going to write this post on Tuesday, but I wanted to give myself some time to collect my thoughts after actually looking at Ryan’s proposal. You can read the plan for yourself here. There’s a lot in there, but since this is a health care blog, that’s where I’ll be focusing. Let me begin by saying, something has to change. This is one area where I agree with Ryan. The federal deficit and the resulting federal debt must be addressed. 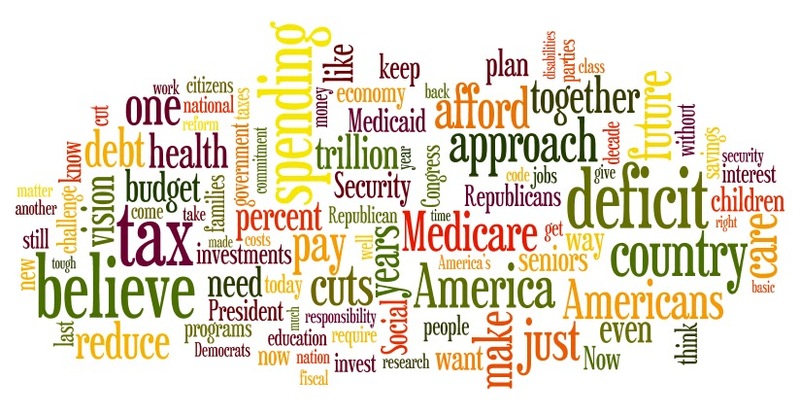 Medicaid, Medicare, and Social Security make up a large proportion of the federal budget, so it makes sense to look at those areas when attempting to save money. And, that is basically the precise point at which we no longer see eye-to-eye. For starters, if Rep. Ryan is so adamant about reducing the deficit, why is he cutting taxes for the wealthy and cutting programs for the poor and the elderly? Didn’t he learn back in Budget 101 that there are only three ways to reduce a deficit? You either reduce spending or you increase revenues or both. You don’t ever reduce revenues. That move alone has me convinced that Ryan is less than serious about reducing the deficit. So, if it’s not entirely about balancing out the bottom line, what is it? I think this is about political posturing and ideology. In policy matters, the GOP is the party of the wealthy. That’s it, plain and simple. They are also the party that despises government programs for vulnerable populations, but it starts to get murky pretty quickly after that. And, it is important to note, a lot of non-wealthy middle and lower-middle class types support the GOP. Much of that has to do with things that the GOP talks a lot about, but never does anything to address. Let me explain. Somewhere along the way, Republicans convinced a large sector of the American people that they were the party of Christians and honest, salt-of-the-earth types. At the same time, they convinced these people that the Democrats were atheistic heathens who were out of touch with reality. Their ruse worked. If you don’t believe me, read this. That might be okay if they actually did something to advance their platform, but they haven’t. Abortion is murder, and murder is sin, ergo abortion is sin, and the GOP is pro-life. Millions of people (I’m guessing) vote Republican on this issue alone. Yet the GOP hasn’t managed to move us any closer to the court overturning Roe v. Wade. Apparently that doesn’t matter. Now ask yourself this question: Who would Jesus deny health insurance? The GOP’s answer is something like: “The 50 million or so undeserving poor and illegals.” You’ll have to forgive me for thinking they’ve missed the mark on that one. At least, that’s how it came off when the Affordable Care Act was being debated, and seniors–bless their hearts–were outraged that the government would get its hands all over their federal Medicare coverage. There was such vitriol–Obama as Hitler, the now-infamous “death panels”, and guns brought to public forums–surely the recently elected Republicans wouldn’t try similar things? And yet they have. Ryan’s plan would privatize Medicare (at least now the seniors’ protest signs will be right) and–get this–basically create a federally-subsidized health insurance exchange for seniors. If that sounds like the Affordable Care Act to you, congratulations. The GOP plan to save money is modeled on the plan Democrats passed last year, which shouldn’t be a surprise. As I and others wrote about, that plan was originally a Republican one to begin with. But, for seniors and the disabled, this is going to mean higher out-of-pocket costs. That wasn’t true under “Obamacare.” If they were so up in arms then, they should be utterly outraged now, but I haven’t seen it. Things are even worse for Medicaid. By turning the program into a block grant, states get a fixed amount of money from the feds. When that’s gone, there is no more coverage, shifting full responsibility for the entire cost of their care onto pregnant women, children, the low-income elderly and disabled. Well, by all means, those seem like the people who are most capable of getting a job and taking care of themselves! There’s no way to reconcile that type of attitude towards the vulnerable with notions of decency, fairness, or Christian morality. If the budget was mine to make, here’s what I would suggest: First, don’t cut taxes for anyone. That doesn’t mean you have to raise them (although I’d look into a flat tax), but by cutting taxes you’re making your job of reducing the deficit harder than it has to be from the very beginning. Second, don’t cut programs that provide for our nation’s most vulnerable populations. There are plenty of other places to find substantial savings. Rep. Ryan’s plan is entitled “A Roadmap for America’s Future.” Balancing the budget is an important part of that, but he would do well to remember that, much like the church his party strives to appeal to, it is the people–not the building or the money–that defines us.